Where was I going with that… oh yeah, ways to let the user know that hey “A BIG UPGRADE IS HAPPENING… SAVE YOUR STUFF”. 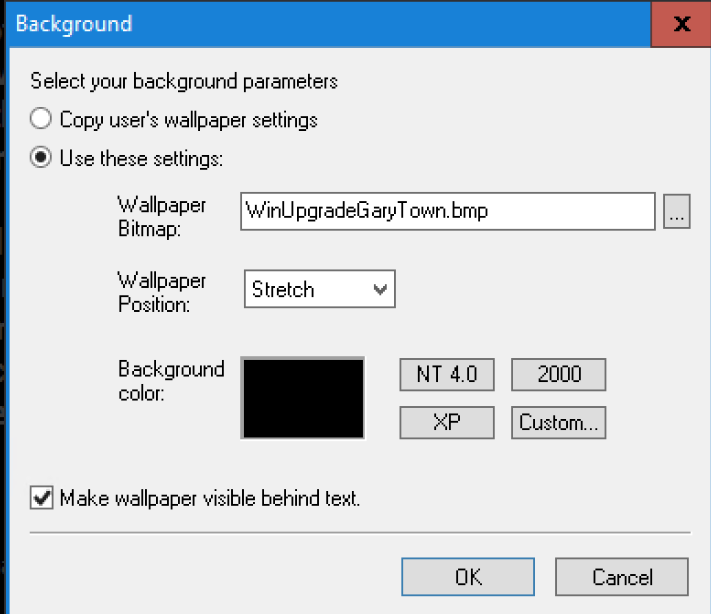 I’ve done this in the past with changing the Lock Screen, creating a method to prevent a user from logging on, but what if the user is logged in, they started the TS, but still just don’t get it… how about we temporarily change the background and put up a message that displays for that logged on user until the moment that beautiful first reboot happens? I say, why not… lets do it. 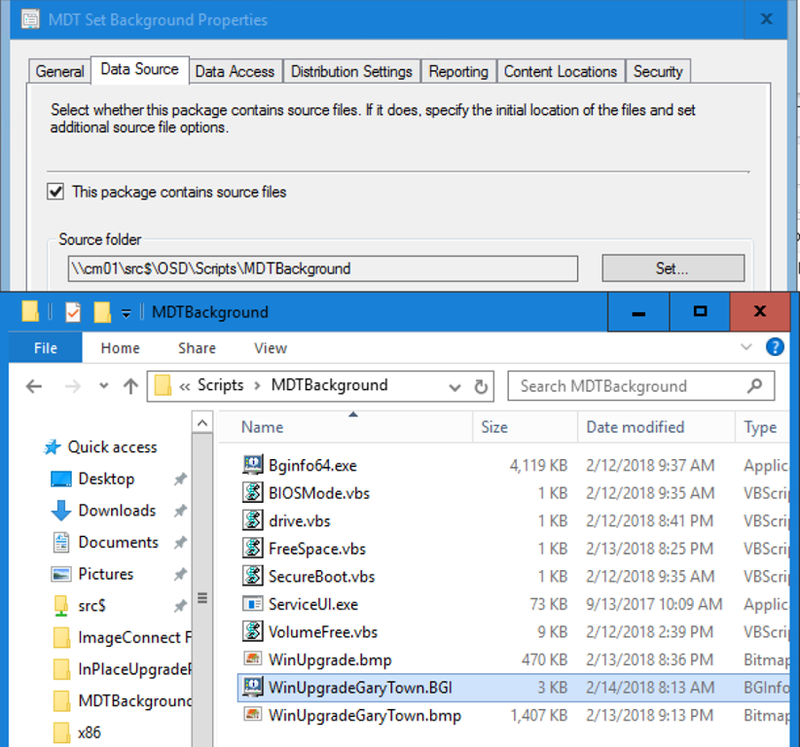 My idea, steal MDT’s Bginfo “Set Status” Step, and add it to the In Place upgrade TS. 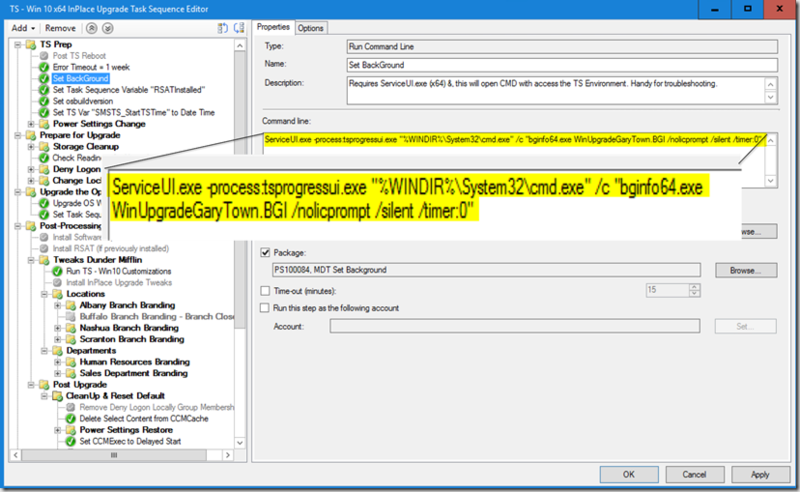 I copied over the “Use MDT Tool Kit” Step, and “Set Status 2” Step, but when it ran that step in the TS… ERROR city. Figured it was too easy. So this is what I had to do. Note, this will be different than the one we used for OSD, as this time, it is running in the OS, and not WinPE. 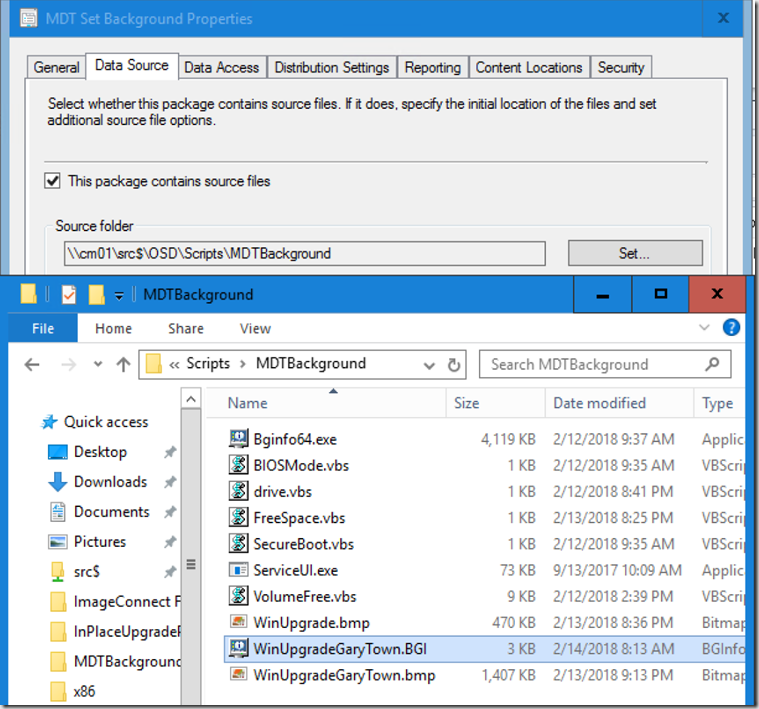 Set your Background, note, do not use the full path, just the name of the file, as all of the required files are located in the same directory. 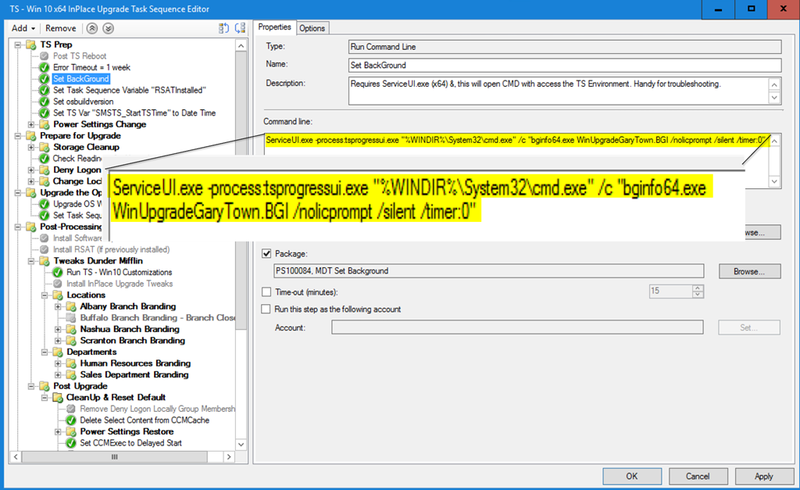 "bginfo64.exe WinUpgradeGaryTown.BGI /nolicprompt /silent /timer:0"
ServiceUI.exe -process:tsprogressui.exe "%WINDIR%\System32\cmd.exe" /c "bginfo64.exe WinUpgradeGaryTown.BGI /nolicprompt /silent /timer:0"
Also have seen this step failed if a user is NOT logged on. So recommend you set to "Continue on Error" if you plan to have it run without checking to see if a user is logged on, and run it without a user logged on. Sorry about that, Link is fixed. Where is the download link on here? I see a 'download here' wording but not showing up as a link. The link is in the middle of this sentence: (I’ve provided all of the files in the zip download, so you can steal those or create your own) - the links aren't underlined by default with this template, I'm thinking I might change that, as links are not very obvious. Alright, spent some time tonight playing with the CSS code, and made some changes to make links stand out a bit more. So if the upgrade fails, I have a custom message that appears indicating what failed, how do I remove the BGIinfo background or turn it off so that the original background returns? When I reboot, it automatically reverts to what it was before, are you not experiencing that? Or do you mean reverting without a reboot? I'm looking into now, I'm pretty sure it's just modifying some registry keys,trying to track down exactly what it's doing so it can be reverted. 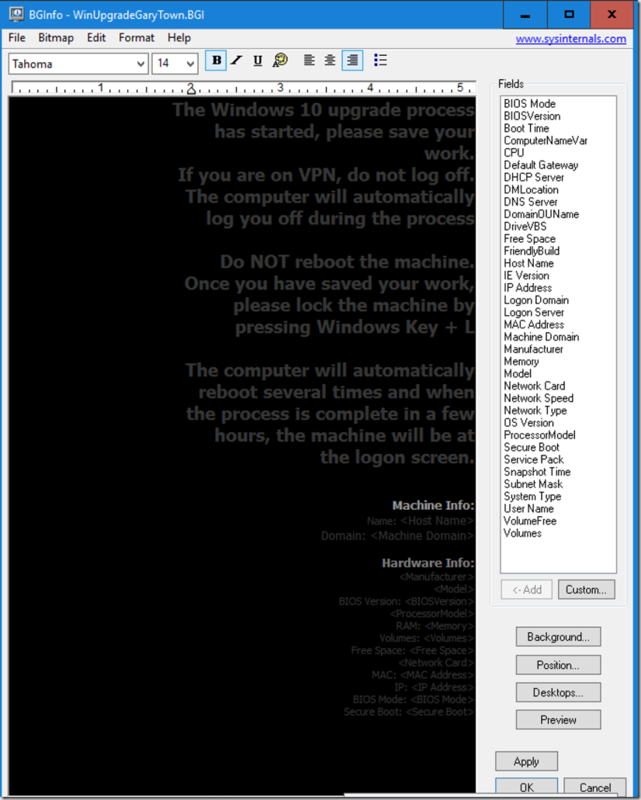 If you run it as a user, it modifies HKCU\Control Panel\Desktop\WallPaper and 2 other values in that key. I'll reply and update the post when / if I figure out how to revert. 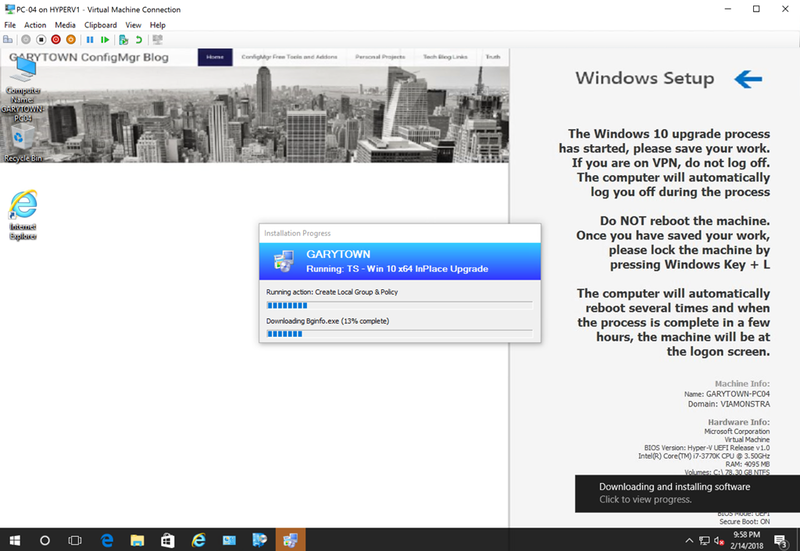 Unsure how you'd revert though without rebooting.